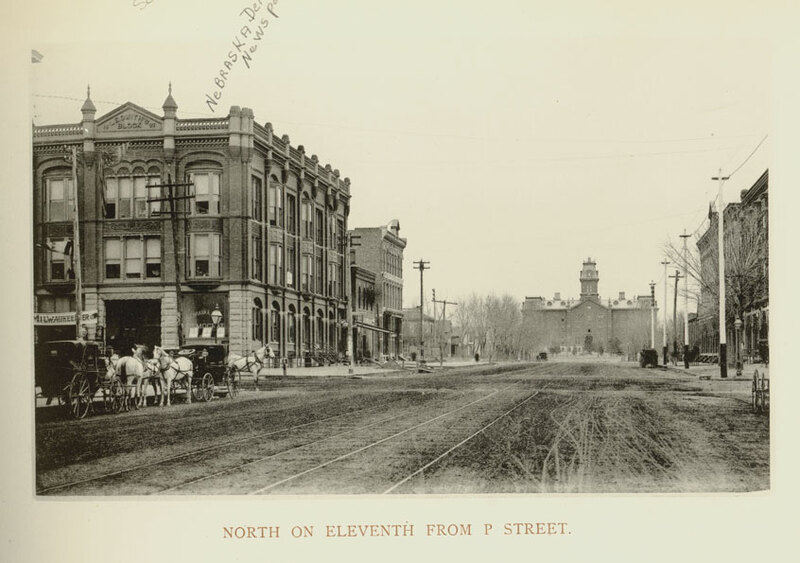 This is a photo looking north on North Eleventh Street from P Street with University Hall at the end of the street. The Merchants' Hotel (or Ledwith Block) is on the left side of the photo on the northwest corner of North Eleventh and P streets. The Ledwith block was completed in 1887 and was financed by grocer and political figure James Ledwith. Its total cost was thirty-five thousand dollars. It was built of pressed brick and was three stories tall. The Ledwith block had a frontage on P Street of fifty feet and one hundred feet on North Eleventh Street. In 1891, W.L. Hunter owned the Hunter Printing House in the basement of the building. Also in the building in that year was a saloon owned by Charles Inman.